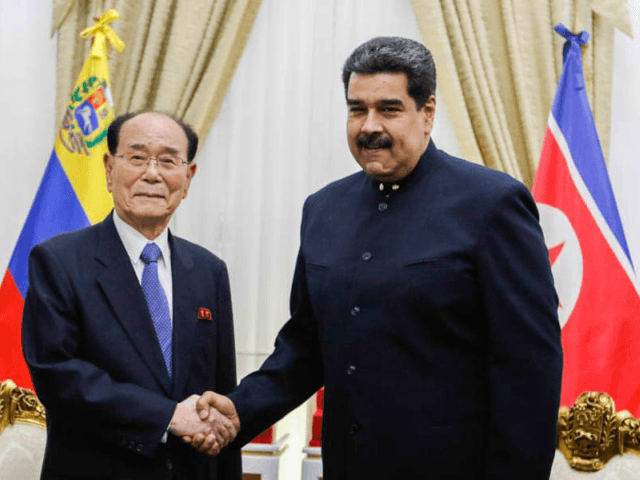 The socialist dictatorship in Venezuela welcomed a visit from Kim Yong Nam, the president of North Korea’s puppet legislature, on Monday for meetings with Foreign Minister Jorge Arreaza and dictator Nicolás Maduro. Kim reportedly also met with Diosdado Cabello, Maduro’s military strongman and prominent television host on Venezuelan government media. U.S. government officials have repeatedly accused Cabello of being one of Latin America’s wealthiest drug lords, allegedly running the cocaine trafficking outlet Cartel de los Soles. Venezuela and North Korea, both leftist authoritarian states, have enjoyed friendly relations for years, deepening under Maduro’s rule. Kim’s visit is reportedly intended to expand political and economic ties between the two countries, which are both under American government sanctions for human rights abuses. In response, Kim reportedly urged stronger “diplomatic, economic and commercial relations.” The North Korean news site NK News reports that among the agreements signed was one to allow for travel between diplomats of the two states without visas. The text of the agreement did not mention abolishing visa requirements for civilians, however. Both nations are currently suffering through significant food crises and experiencing growing numbers of citizens attempting to flee. Many North Koreans who attempt to flee are killed on their way out, or killed or sentenced to life in a labor camp if caught in China, which does not offer political asylum to North Koreans. Venezuelans do enjoy offers of political asylum from neighboring countries like Colombia and Brazil, but the number of refugees fleeing the country has now reached record levels and threatens to destabilize the social nets of Venezuela’s neighbors. NK News adds that the meeting between Kim and Cabello centered around fighting the influence of the United States. Venezuela’s foreign ministry posted a photo of the two, who technically hold the same title since Cabello is the head of the illegal “National Constituent Assembly” Maduro created to replace the opposition-run constitutional legislature. Kim is expected to also make visits to Cuba and Mexico as part of his current tour of Latin America. The former visit is of particular importance to North Korea, as Cuba is one of its oldest and most reliable global allies. Pyongyang recently welcomed Miguel Díaz-Canel, Kim Yong Nam’s analog in Havana, with a “warm embrace” including a forced government parade and several “cultural exchange” theater shows. Prior to that, North Korea sent vice chairman of the Central Committee of the North’s Workers’ Party Choe Ryong-hae to Havana in August, as tensions grew between Pyongyang and Washington. As the second most powerful member of the communist Workers’ Party, experts consider Choe second only to Kim Jong-un in authority in the country.